In keeping with my recent posts of rugged coasts in my home region, here is another beach that is rugged, wild and beautiful. 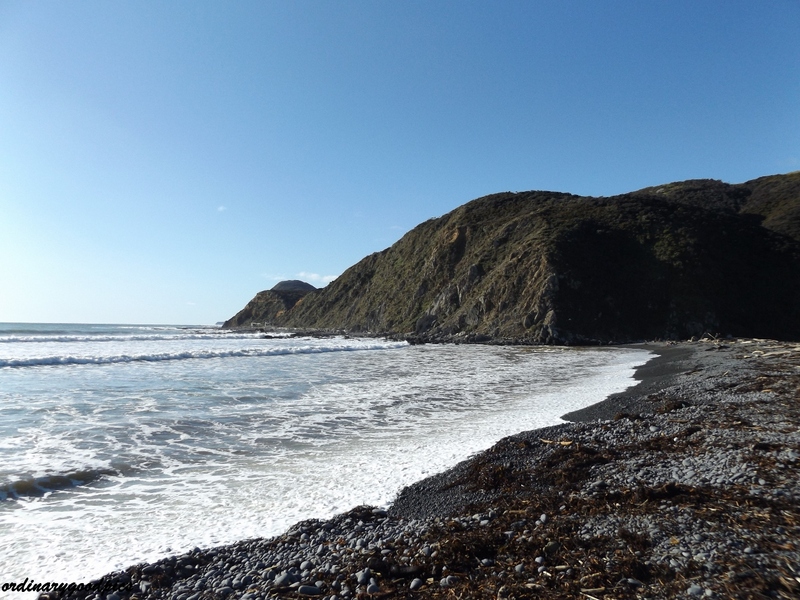 This Department of Conservation website gives more information about Makara and includes a map showing that the deep arcing Ohariu Bay and the beach are not too far from the most south western point of the North Island. This is another west coast beach. The very small settlement can be reached from either Johnsonville or Karori (both suburbs of Wellington). Either route is a narrow winding road with rural views, plenty of surrounding steep hills and roads that require careful attention and care. After reaching flat, more open land the road suddenly offers a view of the bay. On the day we visited the day was crystal clear. 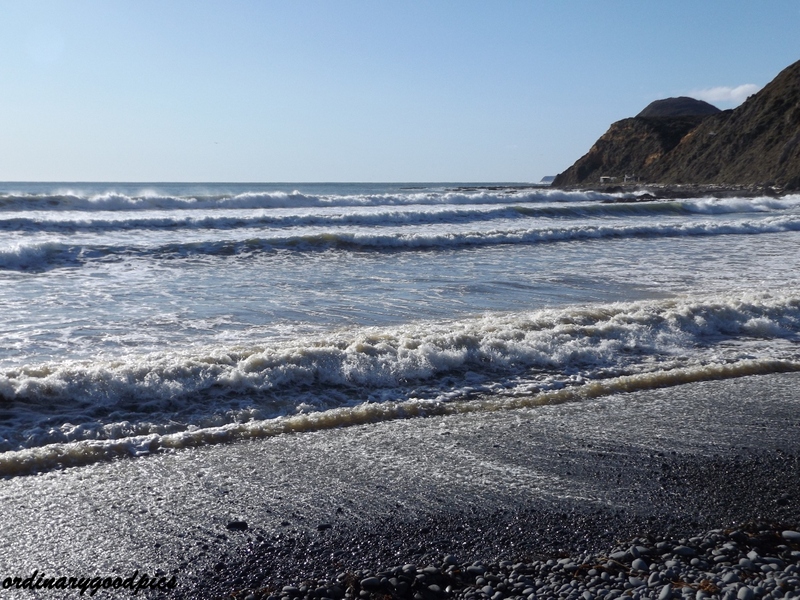 The night before a southerly storm had raged but this beach is relatively sheltered from that wind and these high hills sheltered us from the icy wind that was still blowing. 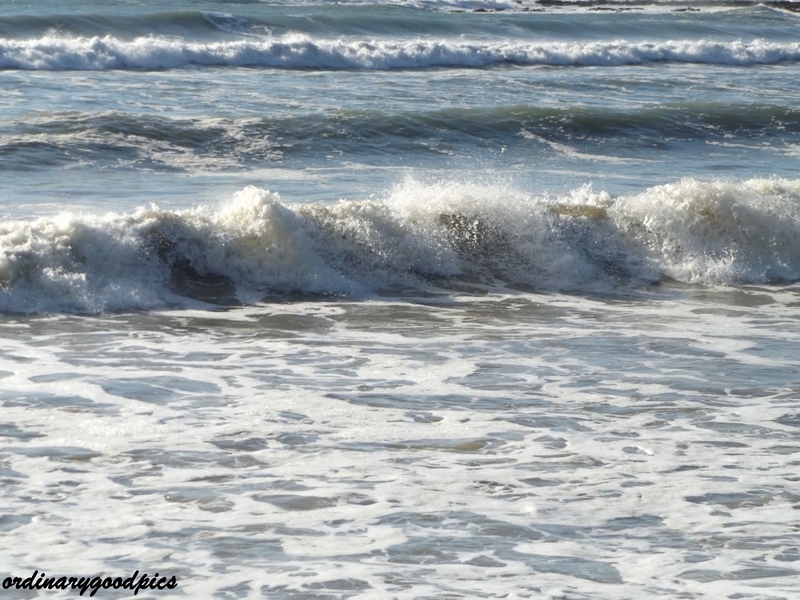 The surf was heavy but not as dramatic as it would have been on the South coast. The beach here is rocky. and the undertow is sharp and strong. This is never a safe swimming beach. 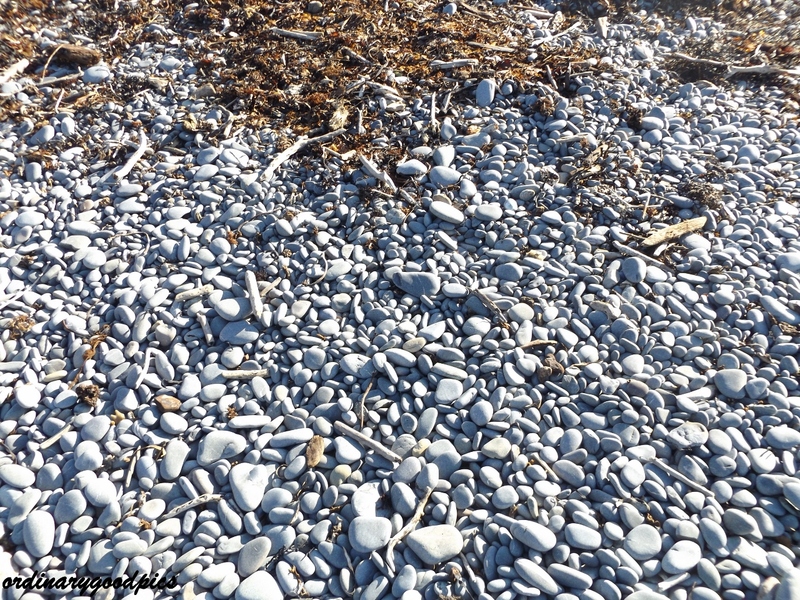 The sound of these rocks being dragged back and forwards with each breaker was deafening but exhilarating. A narrow walking track at the base of the high hills offers views back up the coast to the north and here, in the distance, you can see Mana Island and beyond it, the peak of Kapiti Island. The photo bombing bird is a Cormorant! When the predominant north-westerly wind howls this bay will take a pounding. 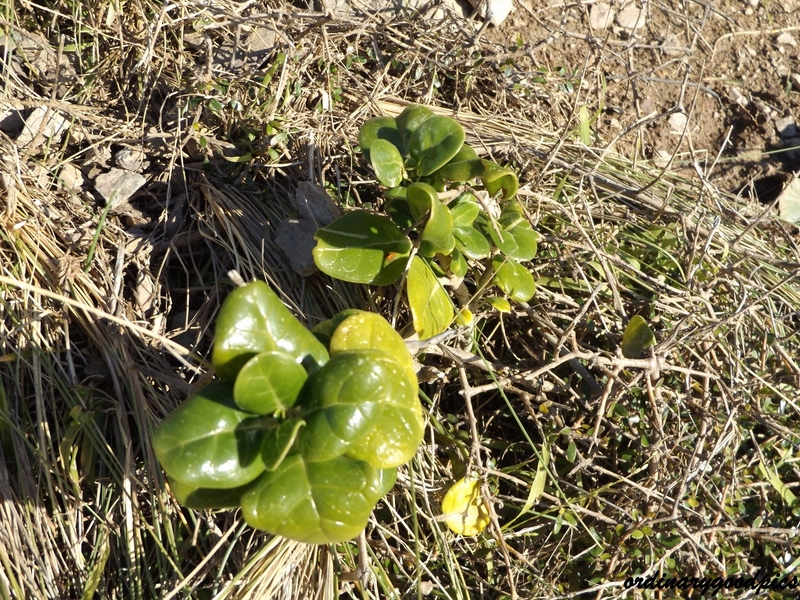 Vegetation reflects the harsh, salt-laden, tough conditions. Flaxes, tufty grasses and Taupata do well but are stunted. 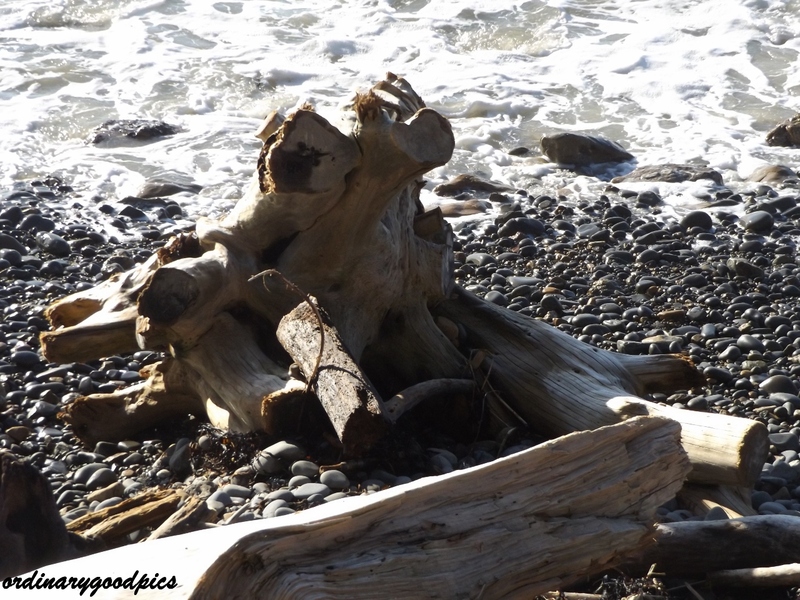 Ocean currents bring huge logs and tree stumps on to the beach. 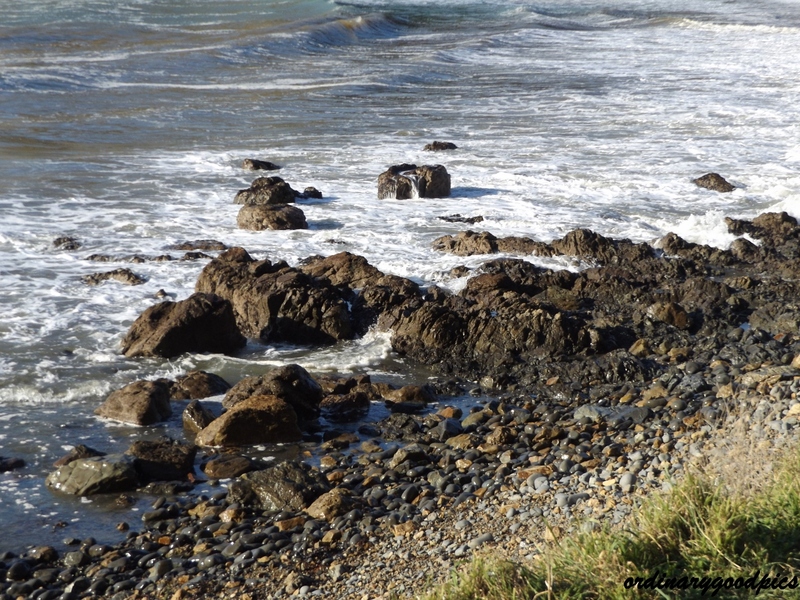 Rock pools offer hidden delights but close supervision of children is needed at all times, given the strength of the sea. 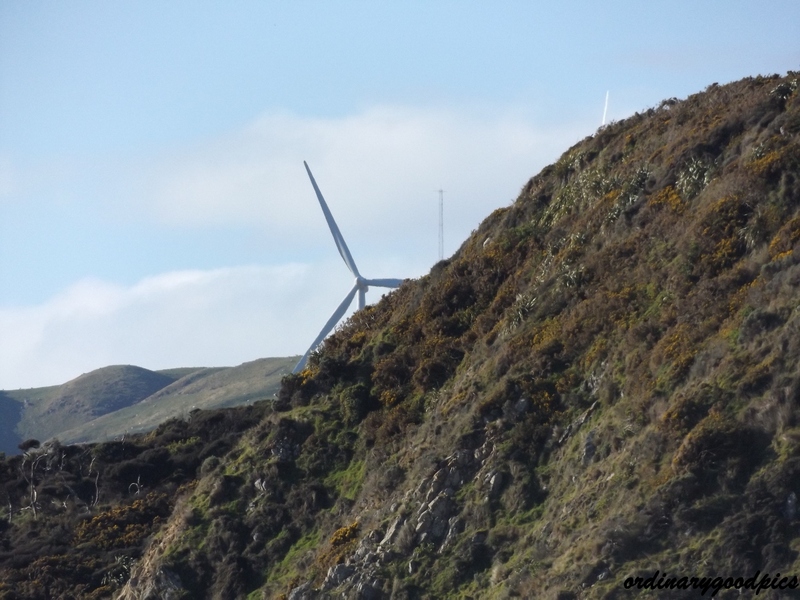 With so much natural energy via the wind in this remote landscape, there is a controversial wind farm now on the hills and from different parts of the settlement the blades of the turbines are visible. Up near this wind farm on the high hills are recreational options for the fit and energetic. I admire the local residents who live in such a remote and harsh environment. Their senses would be sharply alive all the time. I love visiting such wild spots with the exhilaration and beauty they offer but I much prefer a more moderate place in which to find my permanent home. 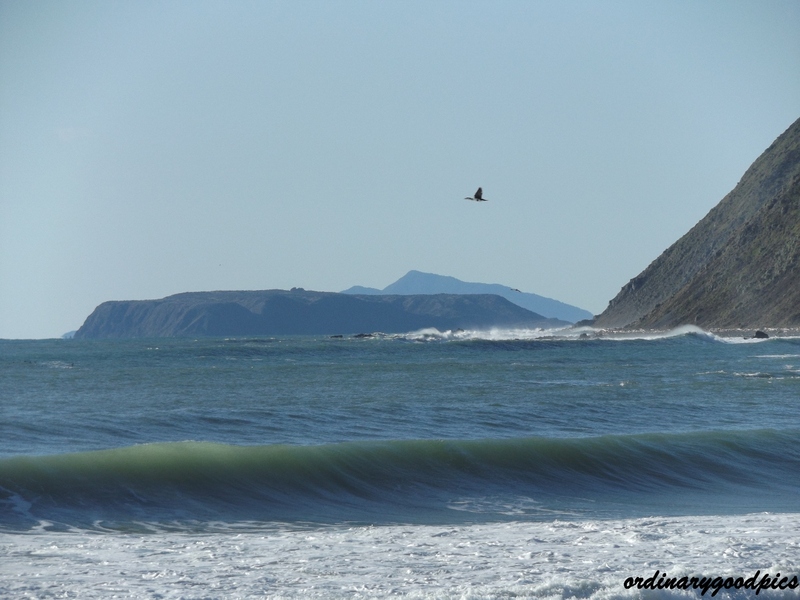 This entry was posted in Uncategorized and tagged beaches, Cormorant, flaxes, grasses, Kapiti Island, logs, Makara Beach, Mana Island, nature, North Island of New Zealand, photography, rock pools, rocks, storms, stumps, Taupata, undertow, walkways, Wellington coastline, windfarm. wind turbines, Winter on August 1, 2015 by ordinarygood. 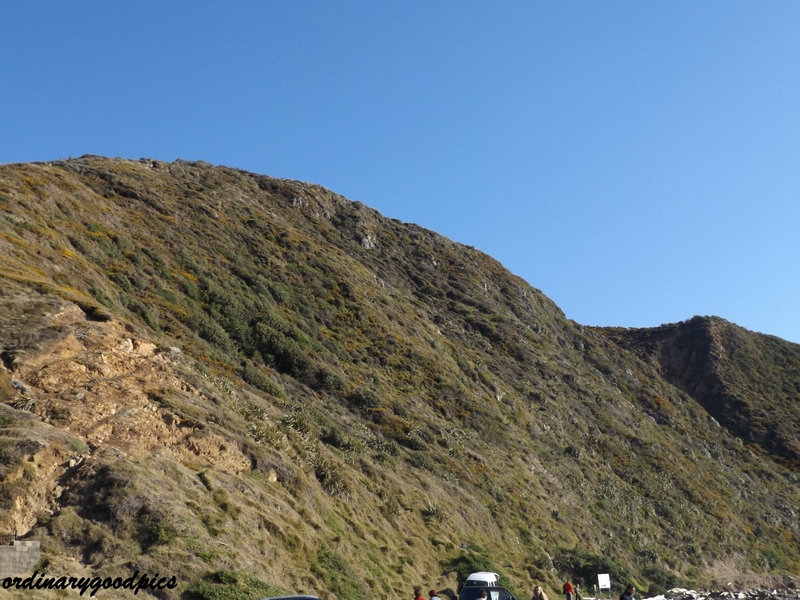 I haven’t been to Makara Beach since I was a young woman, so it was great to revisit through your blog Lynley. I well remember the sound of the stones, and the wildness of this place. You capture it well. It is a rather unique spot. Apparently years ago there was a search for gold and in the early 1900s the settlement was predominantly Italian immigrants. I’m glad you enjoyed revisiting Juliet! Thanks Maureen. It was a beautiful day. It is a very small world! Is the Makara cemetery down near the cafe and houses? Ah yes we passed two cemeteries on the way back to Karori and then on to home. Readers seem to have enjoyed this post. 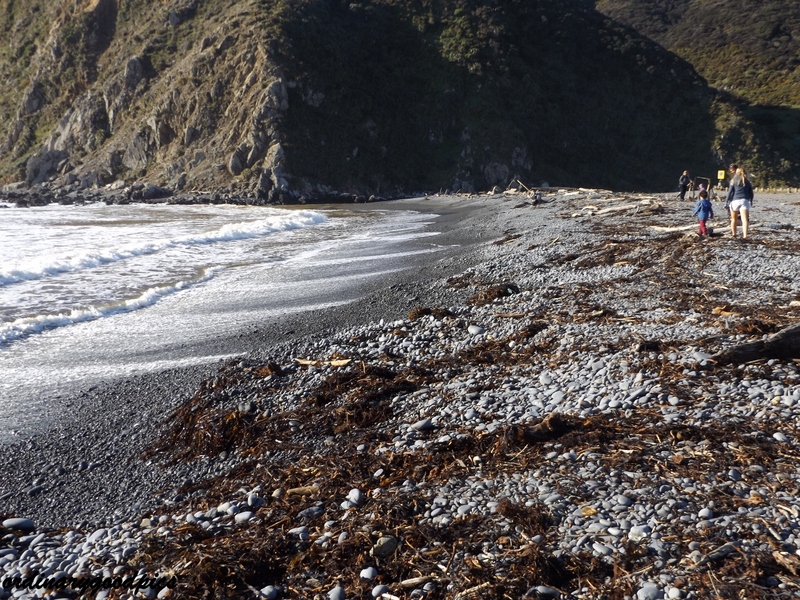 A wonderful place to collect driftwood, I suppose.